This past week, I've seen more and more people visiting this blog after searching Google for information on the cherry blossoms in High Park. I rank highly for such searches thanks to this entry in 2008 and this guide to finding High Park's best cherry blossoms I wrote last spring. I was in High Park this afternoon, and I'm here to tell you it's still too early. The cherry blossoms have not yet bloomed. If you visit High Park today, this is what you'll see. If you visit in a couple of weeks, this is what you'll see. Beautiful Day, hopefully Spring has finally Sprung. I'm in St. Catharines. We've got blossoms down here! Thank you .. I've been TRYING to get someone to tell me as I'm out of town and want to make the trip in .. but don't want to do it if they're not ready yet! Those are beautiful. I love cherry blossoms. Thanks so much, I was about to head out and take pics. thank you... for the update... I'll be sure to keep checking this post. Hey everyone I dropped in today. 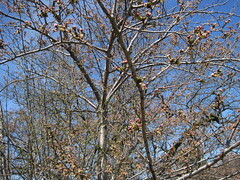 The blossoms have emerged, but they're still in their infancy, that is, kind of small, and a day or two from full bloom. I was just wondering this few days.. thanks Mike. They're starting to bloom... but it's still too early. Any updates? I'm thinking of going there early next week. Early next week might be perfect. They're starting to bloom, just not quite ready. And they'll rock hard for a week after full bloom... and still be pretty cool into early May. Ladies and gentlemen, we have bloomage! Now get your butts to High Park to check it out. 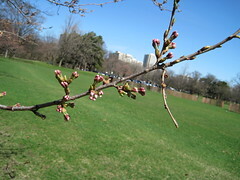 Hello, any report on bloomage of the cherry blossoms for 2011? I expect them to be ready for cameras next week. Any chance you can post pics of what they look like now? I am planning to head down next weekend, will it be too late?? The cherry blossoms are not yet in bloom. I'm planning to go next weekend myself, so I'll be checking in on them before then. I'll post here by Friday. Looks like they will bloom late next week. 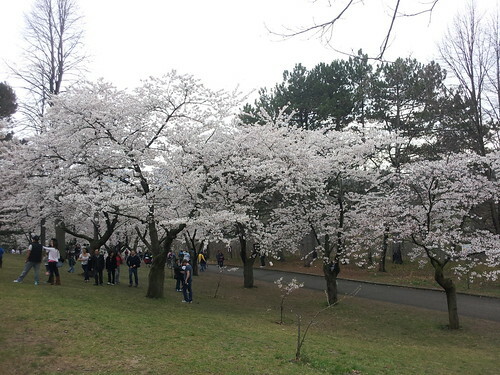 Next weekend, the April 30th weekend, is the weekend for seeing the cherry blossoms in High Park. High Park Cherry Blossoms at peak bloom! Tonight is a good time to check them out, or this weekend. And park legally in the park b/c you will get a ticket. I suggest parking near the park and walking in. I was at High Park today. The Cherry Blossoms looked great!